Everyone has 3 lives: a public life, a private life and a secret life. The Romance is a reality-doc webseries that tells the story of 24 single men and women, ages 24 to 44, in San Diego and their search for love. Along their journey they go on one on one dates, group events as well as get advice and opinions from a panel of judges. A hidden storyline develops, as we meet Miss X, and not everything is as it seems as we head to a surprise ending. And viewers get to vote and participate. Both entertaining as well as educational, audiences find themselves cheering, disliking or not caring for the various characters and over 120 scenic locations, venues and events are showcased in San Diego county. 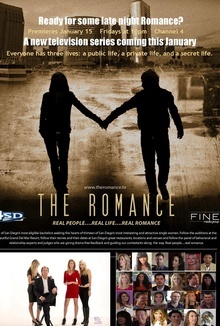 Order all 12 episodes of The Romance TV series for $4.99 . 7 Comments. Add your thoughts.